Perhaps the single greatest triumph of the connected car is location-based security services. Thanks to the GPS and telematics products that are commonly available for most new cars, car owners are able to track the location of their vehicle from cell phone apps. A would-be burglar driving what is effectively a moving tracking device will be caught in no time. These capabilities now extend to the sharing economy, with car rental company SnappCarsaying it would allow car owners to track their vehicles when they’re rented it out to a user of the service. And vehicle security is about to take another significant step forward. At this year’s CES trade show, Gentex is prepared to reveal a slate of new technology, one of which seems straight out of Minority Report: in-vehicle retina scans. As Downing notes, the security advantages of this type of driver identification go beyond merely ensuring that authorized users are operating a vehicle. It can provide an additional layer of security for payment services at toll booths and gas stations. Its uses even extend into infotainment: Upon identifying a driver via a retinal scan, a connected car system could automatically implement their preferred settings for seat positioning, cabin temperature and music. The mechanism that will trigger the retinal scan in equipped cars is slick. Once in the car, all a driver needs to do is look into the rearview mirror. 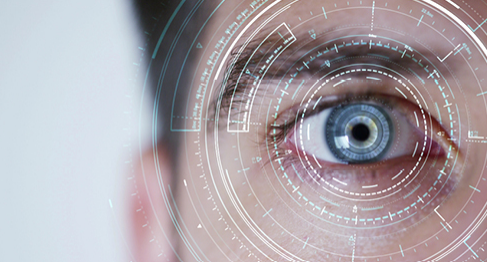 Their presence will be detected, and the system will commence the scan that uses near-infrared emitters and an iris-scanning camera as hardware. The retina scanning is only one of the new features that Gentex plans to reveal at CES. HomeLink Connect is an app that allows drivers in to control radio-frequency devices like garage doors from their car. It can even allow them to control IoT devices like connected thermostats, lighting and security systems, all from the comfort of a vehicle.